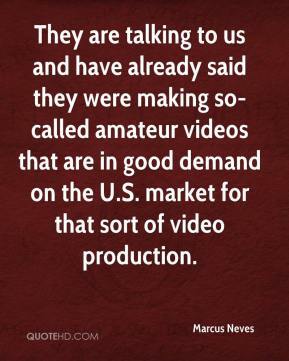 They are talking to us and have already said they were making so-called amateur videos that are in good demand on the U.S. market for that sort of video production. 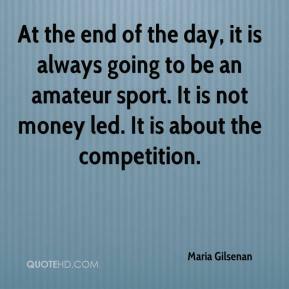 At the end of the day, it is always going to be an amateur sport. It is not money led. It is about the competition. 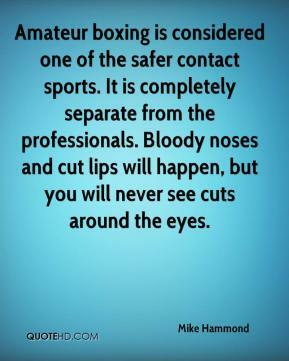 Amateur boxing is considered one of the safer contact sports. It is completely separate from the professionals. Bloody noses and cut lips will happen, but you will never see cuts around the eyes. I like the format. I like the casual atmosphere that you are playing with your amateur partner and just walking down the fairway and talking about anything. And then, you know, the golf courses I love, they just set up well for me. I have played them so much that I know what to do out here. 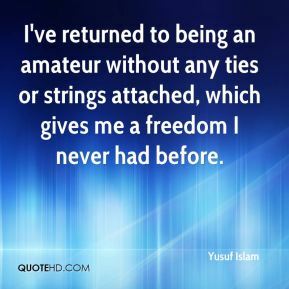 It's good for an amateur fighter to lose once in a while so that you can get back to work and train harder to maintain that No.-1 ranking. When you're No. 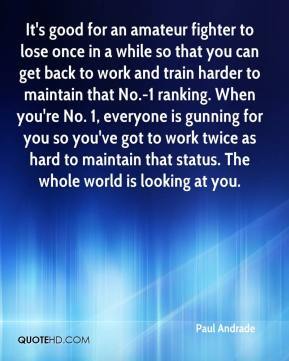 1, everyone is gunning for you so you've got to work twice as hard to maintain that status. The whole world is looking at you. 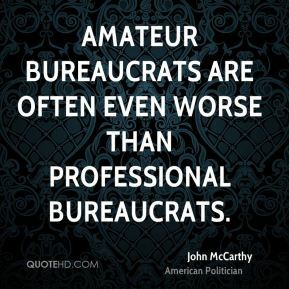 It's hard to say who is an amateur or pro now. 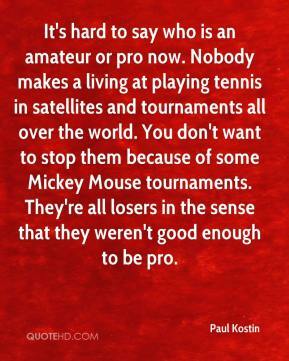 Nobody makes a living at playing tennis in satellites and tournaments all over the world. You don't want to stop them because of some Mickey Mouse tournaments. 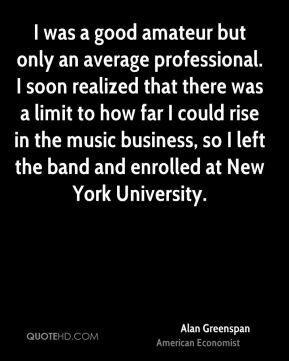 They're all losers in the sense that they weren't good enough to be pro. 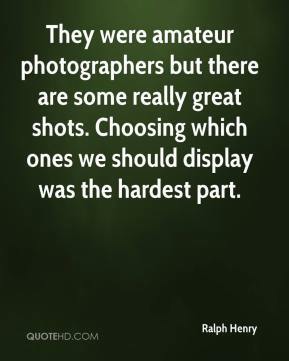 They were amateur photographers but there are some really great shots. Choosing which ones we should display was the hardest part. 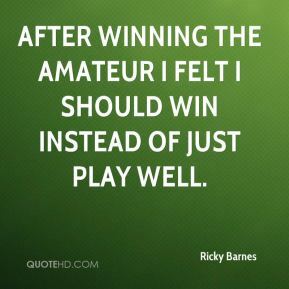 After winning the Amateur I felt I should win instead of just play well. 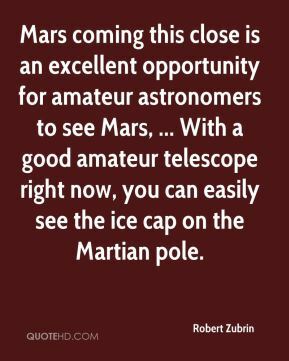 Mars coming this close is an excellent opportunity for amateur astronomers to see Mars, ... With a good amateur telescope right now, you can easily see the ice cap on the Martian pole. 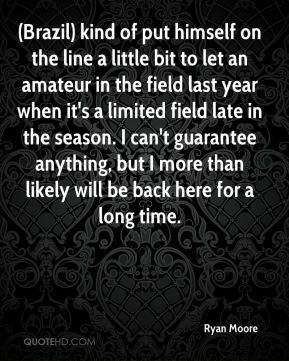 (Brazil) kind of put himself on the line a little bit to let an amateur in the field last year when it's a limited field late in the season. I can't guarantee anything, but I more than likely will be back here for a long time. That was my amateur background. 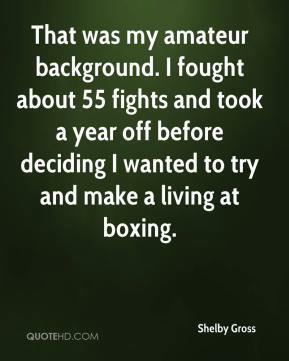 I fought about 55 fights and took a year off before deciding I wanted to try and make a living at boxing. 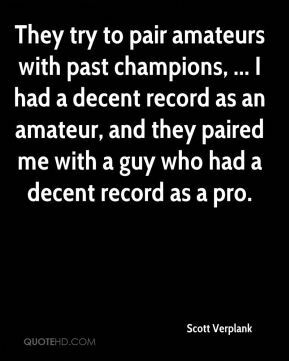 They try to pair amateurs with past champions, ... 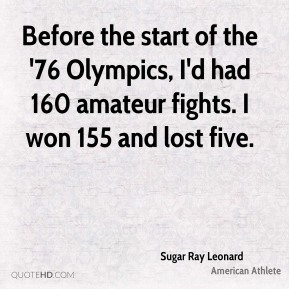 I had a decent record as an amateur, and they paired me with a guy who had a decent record as a pro. 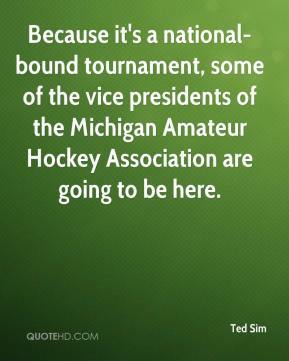 Because it's a national-bound tournament, some of the vice presidents of the Michigan Amateur Hockey Association are going to be here. He's a nice guy. He's passed a couple of tests. 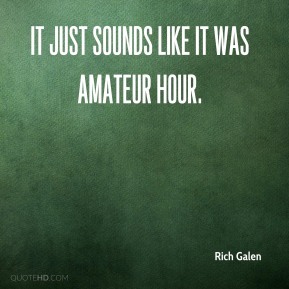 He has a good amateur background, which is important. 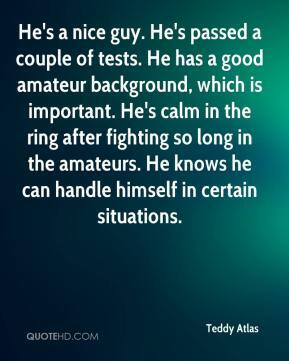 He's calm in the ring after fighting so long in the amateurs. He knows he can handle himself in certain situations. We got in contact with him from the airport. He uses amateur radios, and that's how we reached him. 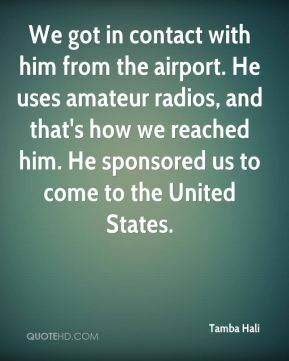 He sponsored us to come to the United States. 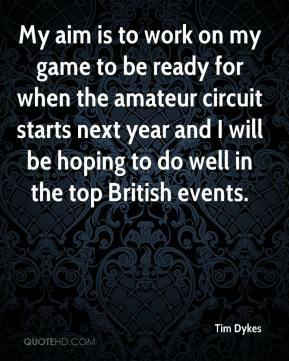 My aim is to work on my game to be ready for when the amateur circuit starts next year and I will be hoping to do well in the top British events. 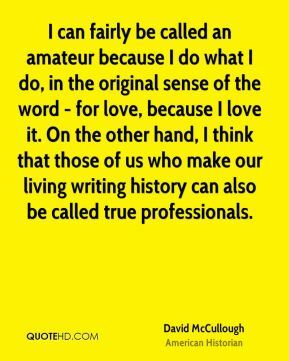 Mostly, we are amateur historians. 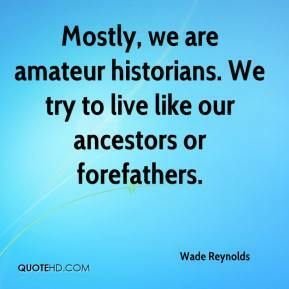 We try to live like our ancestors or forefathers. 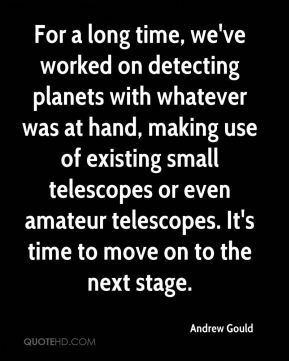 For a long time, we've worked on detecting planets with whatever was at hand, making use of existing small telescopes or even amateur telescopes. It's time to move on to the next stage.